EThembeni School in Inchanga, KwaZulu-Natal benefited from a fundraising campaign led by Minister Michael Masutha when ICT giants, Mustek donated 10 laptops to the school on 10 January 2019. The initiative was started in November 2017 and it aims to raise funds in support of public schools across the country for learners with special needs. Mustek donated 10 laptops and software designed to assist the blind and partially sighted learners. The handover was coincided with the ongoing back to school campaign programme which aims to support education through offender labour. 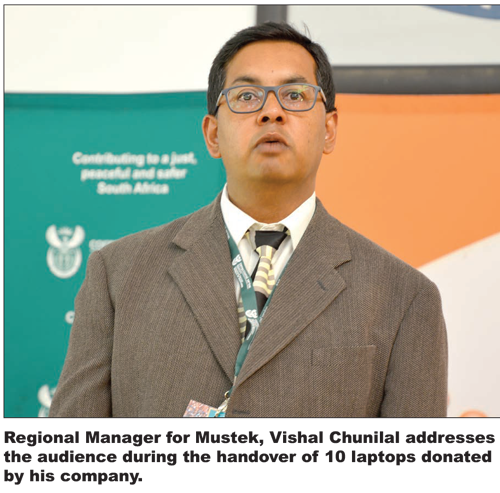 Mustek is one of the largest assemblers and distributors of personal computers and complementary ICT products in South Africa. Minister Masutha said Mustek pledged a donation during the fundraising dinner in 2017 and the handover was a fulfilment of their promise. He said the aim of the initiative was to mobilise resources for special schools in order to expose deaf and blind learners to digital learning and specialised technology. The Minister being partially blind himself understands the predicament that the visually impaired learners encounter on daily basis. He said disability challenges a person to be innovative and to tap into their own creativity. “I believe that technology is at the centre of promoting human rights for all, “he said. EThembeni School is a full residential school with about 300 physically disabled and visually impaired learners. Mr Braam Mouton, the principal of the school said the successful opening of the school in 1984 was built on good relationships and partnerships with government, private companies and friends. He applauded the initiative taken by the department in partnership with the National Council for the Blind to continuously assist with the education of the blind and partially sighted children. The name eThembeni means a place of hope. The Shining Stars, a musical offender group from Pietermaritzburg kept the audience entertained during the event. As part of the back to school campaign, the department also identified the needs of the school and some offenders used their skills that the department imparted as part of rehabilitation, to make sure that the school is in a proper state of repair. EThekwini Deputy Mayor, Fawzia Peer, Regional Manager for Mustek, Vishal Chunilal, Head of Pine Town District of the Department of Basic Education, Sibusiso Kheswa, representatives from the National Council for the blind were some of the dignitaries who were present during the handover.